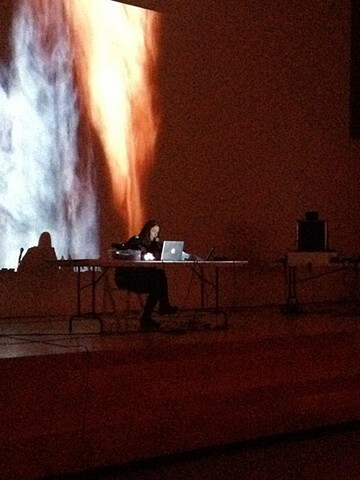 Performed at the Everson Museum of Art, Syracuse, NY on September 19, 2014. Perpetual Drift is a work in progress. This video documents the first reading of the work in front of a live audience. Perpetual Drift takes place in the not too distant future. The earth has undergone drastic climate changes, and a crew aboard a lost ship at sea, struggle to adapt to an uncertain future, and the psychic and emotional stresses created by a series of tragic and unexpected events. The crew of the ship are: the Captain, Ether (a time traveler), the robot (a depressed poet and ships navigator), Echo (the mythical nymph), the Doctor (Mistress), a female scientist who specializes in rare botanics, and lastly  the ship itself. The story embodies environmental concerns we face as a collective human family ,and the death of old structures giving way to new life forms, systems, and organizations. In this work, I perform each character's voice, manipulating my voice through electronic filters, and compose an electro-acoustic soundtrack comprised of analog and digital synths, musical instruments, and original field recordings.